This beautiful "God is Love" diamond heart and cross necklace in 14K white gold from Apples of Gold Jewelry is the perfect way to wear a symbol of your Christian faith close to your heart! 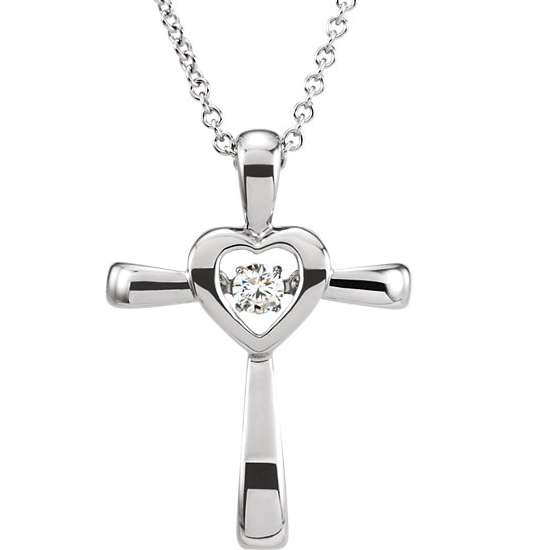 The lovely, polished white gold cross comes with an 18 inch necklace, and the center of the cross is featured as a heart. In the center of the heart is a single 0.08 carat diamond, which has been rated G-H for color and I1 for clarity. The pendant measures 0.83 inch tall and 0.59 inch wide. The women's pendant is a great choice for every day wear or special occasions, and will never let you forget how special God's love is. Includes an 18" matching 14k white gold cable chain necklace. We guarantee our God is Love Diamond Heart and Cross Necklace to be high quality, authentic jewelry, as described above.